It's not really a fan's responsibility to ensure that an item on ebay is legit. 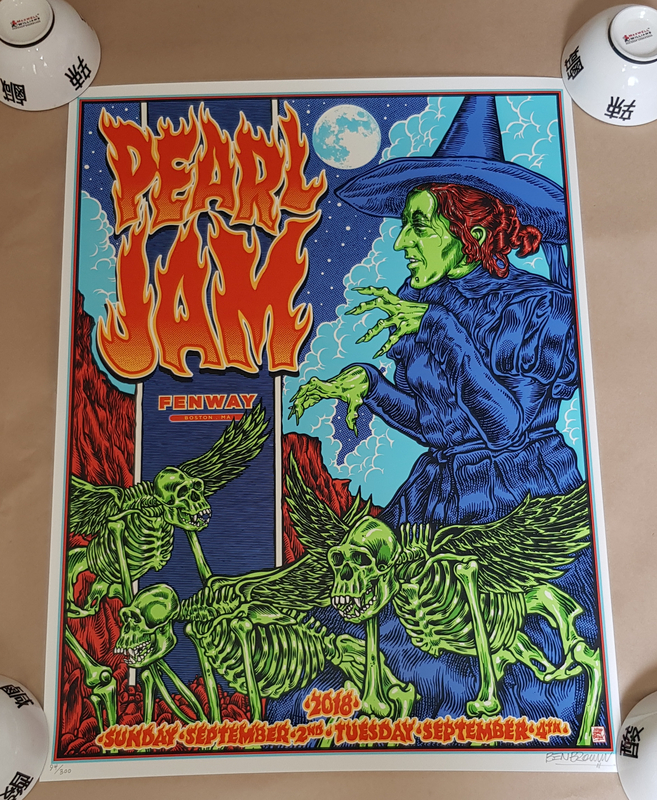 It's Pearl Jam's responsibility to shut down those sales. I'd personally never buy a Chinese printed PJ poster. I can't say that I haven't been tempted to buy one of those Chinese made banners of the PJ album covers, which are pretty cool. But I haven't. I did, however, buy a Chinese Beatles CD Box set that is pretty sweet for $30 and free shipping. I don't necessarily feel bad about that because I've bought the same Beatles albums at least 3-4 times each (vinyl, cassettes, cd's) in my lifetime. It's a fans responsibility to not buy that crap. If you knowingly buy it then you are part of the problem. Would you buy fake autographs even though they looked "ok" or because they were a faction of the price? I would never buy a fake poster, knowingly, out of respect for the artist and because I'm a collector who cares about receiving a high quality print, on quality paper. You and I know what's fake out there and we do the right thing. The average Joe might not. Sound quality = the remaster quality. Photos on cd inserts are high quality obvious Xerox copies. The box itself is awesome quality. The song credits mis-spell names, which seems intentional. For example, "McCortney" or "Lenin" "Horrison" in some cases. That's pretty weird. Seeing these together makes me really wish he did a Wrigley as well for the trifecta! Oh, For sure. I had it all planned out. He could do a Wrigley one as well. Then of course there would be a Wrigley Variant. Then he could do 300 UnCut sheets. Then to really break the internet he could do 100 of an UNCUT WITH ALL 3 VARIANTS. Imagine the money he/10C could have made. Uncut sheets would of been sweet! Jack White did this with his cooperstown show. Pretty cool. Mumford prints have been shipped out! 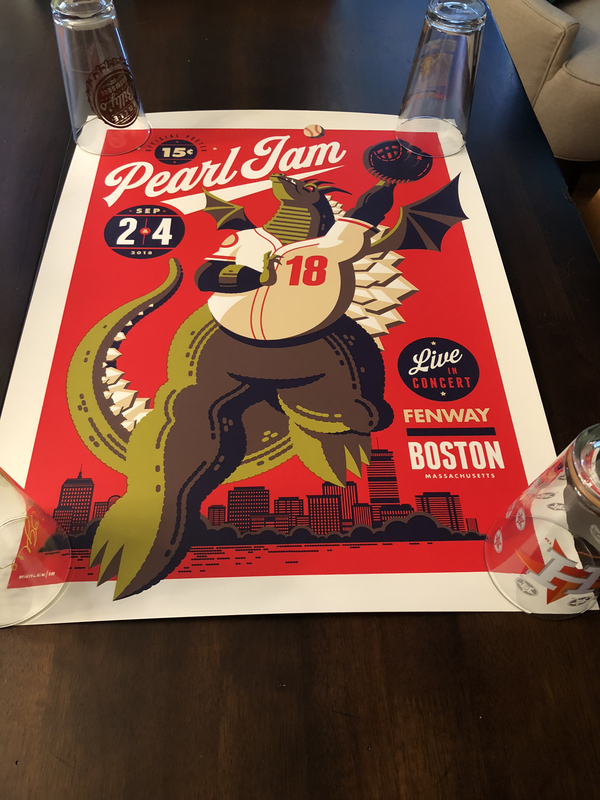 That's it on the 2018 10club / Pearl Jam poster sale experience! 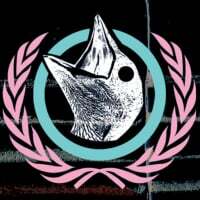 Next up .. 2018 Mystery Poster sale? 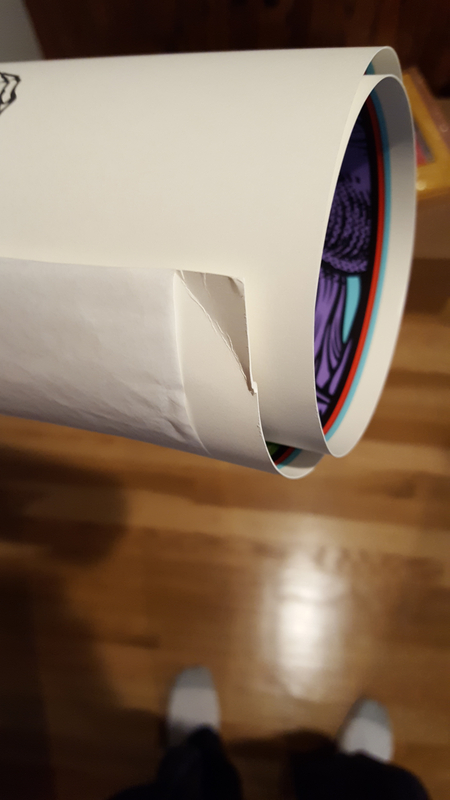 Ben Brown variant arrived tube intact but poster placed at the edge of the craft paper so corner is bent and partially torn. Ben Brown poster arrived in perfect condition. My Boston Klausen showed up today and was perfectly fine, no damage. Was very Happy!! Tour shirts rarely have showed up in the Goods section. 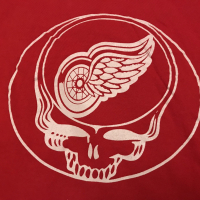 Sometimes they have shown up in mystery box sales in the Goods section and then one time a third party site sold some mystery boxes with shirts and stickers. Forget the name of the site. 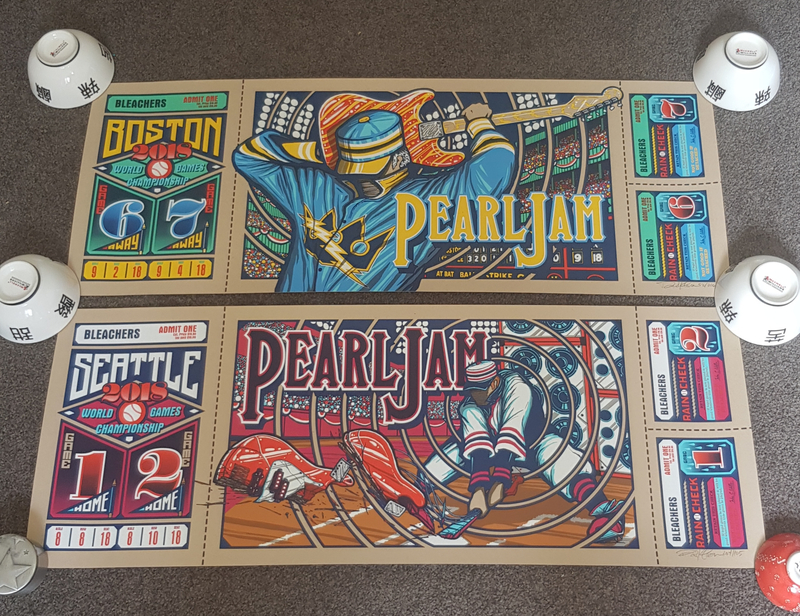 Anyone else still waiting on their Boston poster from Ben? I am. I live in the Chicagoland area. I received notification that it was shipped over 2 weeks ago. However, Ben told me that he does not use shipment tracking because it is too expensive. I fully expect my poster to sit at Chicago customs at O’hare airport for another 2-4 weeks as usual there...it is pathetic how long international packages sit at O’hare. 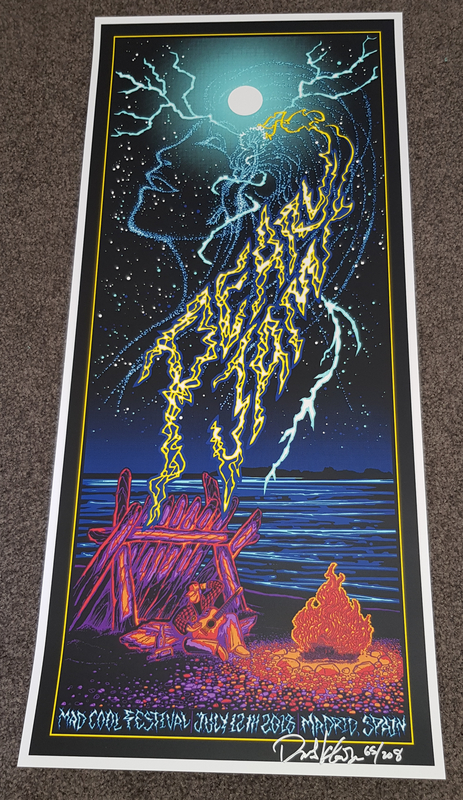 That being said, the amount of time it has taken to receive this poster, along with the “condition” of the poster upon arrival that other members have shared, as well as no shipment tracking for the poster, I have to say buying from Ben hasn’t been the best experience. Yup I am waiting. I’m in RI and it shipped around 10/16 I think. It arrived today in RI! And it’s perfect. EDIT: arrived in perfect condition. Well packaged too!